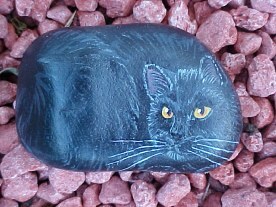 Since, like snowflakes, no two stones are alike, each "pet" created is based on the shape and alignment of the stone used. 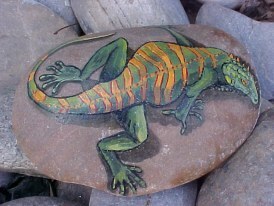 Some are flat and rounded, some are upright, allowing for more detail. 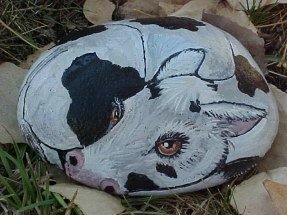 As an artist I look high and low (sometimes very low) seeking special stones and then envision exactly what animal is best suited for the shape of the rock. 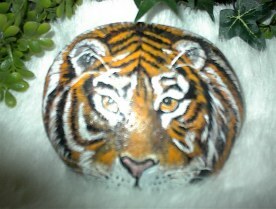 The rock itself dictates exactly what animal I paint. 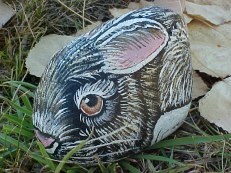 If the rock is a bunny-ish shape..then a bunny magically appears. "Purr-fect Pets" are predominantly cats. Go figure. gift giving even more SPECIAL!! IDEA!!!!!! Put in a small wicker basket filled with shredded paper. Add a pretty bow and you have the "Purr-fect gift." IDEA!!!!!!! Hospital patients. The best gift I ever gave was to a long term Cancer patient. 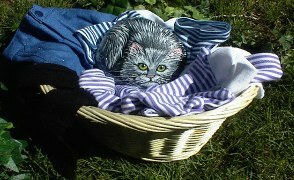 A "Purr-fect Pet" painted to look like hers, a basket and ribbon..made her day..and mine. She kept it on her hospital bed to the delight of visitors and nurses. IDEA!!! Set in the corner of that plant. You know, the one that never quite bushes out. IDEA!!!! A friend recently lost her pet due to illness. She could not stand the thought of getting another one. A "Purr-fect Pet" solved that problem. Special orders can and will be done!! 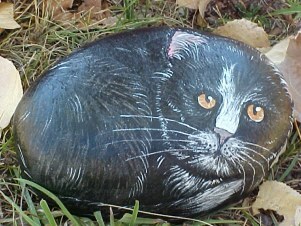 Why not immortalize YOUR pet?? I will need a good clear picture of your pet, face frontal is the best, with enough of the body showing so I can get an idea of coloring. IDEA!!! A "Purr-fect Pet" on your desk at work will make your co-workers smile. Just don't throw at the boss! IDEA!!! 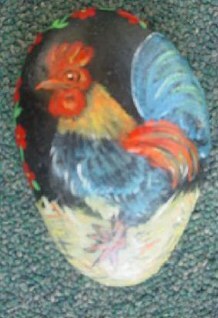 A great gift for shut-ins and the elderly who cannot really care for a live animal. All they have to do is dust this one. IDEA!!! Wonderful for children ..you know, those who promise to feed and take care of their pets but never do? They can't break a "Purr-fect Pet" either! IDEA!!! 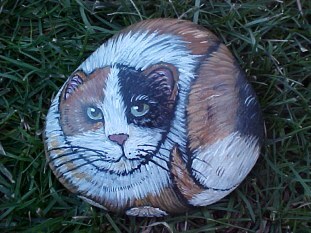 Create an everlasting memorial for a deceased pet. Your pet's picture on the front, the important dates on the back. 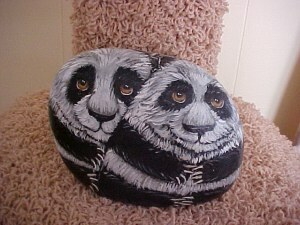 This is a great, personal way to immortalize your pet! IDEA!!!! Stuck in an apartment that won't allow pets? What are you waiting for? No pet deposit fees either! IDEA!!!! 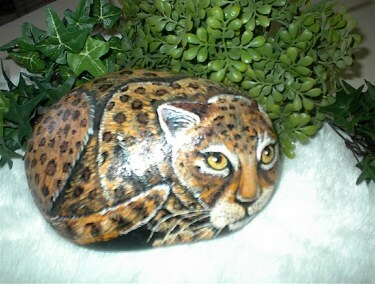 Use as a doorstop...a bookend... the possibilities are limited only by your imagination!